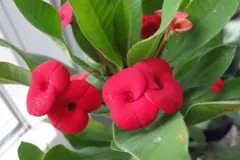 Euphorbia Mili or Crown of thorns is a flowering indoor plant that boasts cheerful blooms in a wide range of colors. The two-petaled flowers almost look like little butterflies! The blooms are a delicate contrast to the plant's extremely spiny stems. This easy-to-grow houseplant is sure to be a showpiece wherever you grow it in your home! Just be sure to keep crown of thorns away from walkways and other spots where you might encounter its spines. 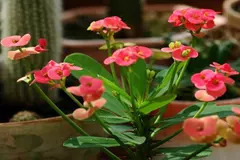 Care Instructions Grow Euphorbia Milli or Crown of Thorns in bright light for the most blooms. You can grow it in medium light, but if this houseplant doesn't get enough light, it doesn't produce flowers. Direct sun on the leaves is fine, even in hot-summer climates. Water it sparingly. This easy-to-grow houseplant is actually a succulent; it may need water only once every couple of weeks. 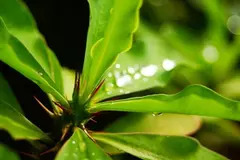 If it stays too wet, the plant will drop all of its leaves and rot, so be sure to give your crown of thorns good drainage. Fertilizing your crown of thorns in spring and summer can also help it bloom better. While it can get by with fertilizer just once or twice a year, feeding it more can certainly help it produce a bigger, better display. When feeding this flowering houseplant, be sure to follow the directions on the fertilizer package. Crown of thorns is not intended for human or animal consumption.